Missed field goals will haunt Alcorn State. LORMAN, Miss. 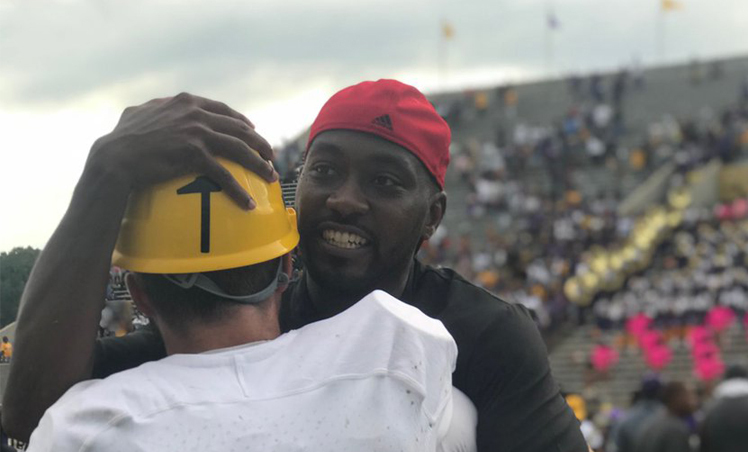 – The statistics didn’t tell the tale of the tape Saturday as the Alcorn State University football program outgained Alabama State 530-240, but Alabama State survived 28-25 in five overtimes at Jack Spinks-Marino Casem Stadium on Homecoming. The Braves (4-2, 2-1 SWAC) had the opportunity to win at the end of regulation, but a 28-yard field goal was missed wide-right with no time remaining. Alcorn missed a field goal on the first possession of overtime, but sophomore Qwynnterrio Cole came up with an interception on the defensive side to keep the game alive. Both teams missed field goals in double overtime. In triple overtime, the Braves scored on a 22-yard rush by junior De’Shawn Waller and converted the extra-point to go up 22-14. Though, the Hornets (2-3, 1-1 SWAC) answered with a six-yard touchdown and a two-point conversion to tie it again 22-22. Alcorn and ASU exchanged field goals in quadruple overtime before the Braves missed one on the opening possession of the fifth. The Hornets won the game on a 37-yard field goal by Hunter Hanson. Waller, the reigning SWAC Newcomer of the Week winner, turned in a career day for the Braves with 214 rushing yards and two touchdowns. As a team, Alcorn rushed the ball 69 times including 20 carries for 94 yards by senior P.J. Simmons. The Braves outrushed the Hornets 408-85. The Hornets erase an early Florida A&M lead.